Chemical reactions involving acetonitrile (CH3CN) most often occur as the result of activating the C-N triple bond, while the C-H bonds are generally considered inert. Weak intermolecular hydrogen bonds of the N - - H - C type, however are susceptible to modification by applied pressure. Now a group including CDAC Research Scientist Zhenxian Liu, have shown that at modest pressures in the diamond anvil cell, the C-H bond in acetonitrile is activated and results in the formation of an amino group, initiating polymerization of the molecule. Infrared Spectroscopy Beamline U2A at NSLS has played a key role in the characterization of a new polymeric material synthesized at high pressure from acetonitrile, (CH3CN). 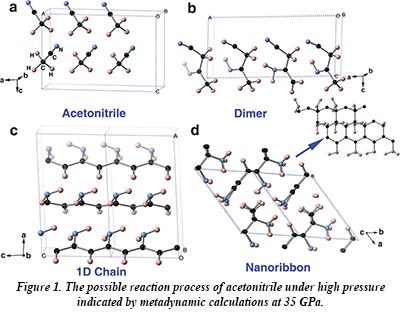 Acetonitrile undergoes a phase transition at about 5 GPa, and then becomes amorphous at about 20 GPa. In this new work, infrared spectroscopy shows the presence of C=N, C=C and -NH2 group vibrations above 23 GPa, indicating that a polymerization reaction has taken place involving transfer of a hydrogen atom from the H3C- group to either the the other carbon atom or the nitrogen atom. The polymerization reaction results in the formation of dimers, one-dimensional chain and two-dimensional ribbon-type structures with both sp2- and sp3-bonded carbon atoms (Fig. 1). The sensitivity of infrared spectroscopy to the presence of the C=C, C=N and -NH2 groups permits the observation of the onset of polymerization within narrow pressure intervals. At room temperature, the onset of polymerization takes place at about 32 GPa, but at 251 oC, the reaction takes place at only 7 GPa. Upon decompression, ammonia is released and a carbon-enriched material is formed. Acetonitrile is one of a number of organic compounds that have been discovered in outer space and is thought to be involved in the origins of simple amino acids, one of the basic molecules of life. In a cosmic event such as an asteroid collision, the pressures and temperatures generated can be very large, well exceeding the conditions of the current experiments. With the addition of oxygen to acetonitrile, possibly through reaction with carbon dioxide or water, complex carbon structures similar to the kind proposed for early formation of amino acids on Earth may be realized [H. Zheng et al., Angew. Chem. Int. Ed. 55, 12040 (2016)].